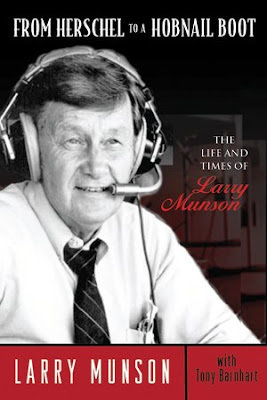 Although it is not going to be officially released until September 20, 2009, fans of legendary University of Georgia Football radio play-by-play man Larry Munson (as well as others) can now pre-order his autobiography, From Herschel to a Hobnail Boot: The Life and Times of Larry Munson , over on Amazon. The Amazon price is $16.47, about $8.34 less than the publisher's suggested price. Munson is a voice and personality that had to grow on me, as I am a Damn Yankee that happened to relocate to Athens, GA 15 years ago. Even so, I am the first to admit I miss hearing him on Saturday game days. I hope to have a full review of the book available as soon as I can get ahold of a copy. To pre-order, you can visit the Amazon Books site for From Herschel to a Hobnail Boot: The Life and Times of Larry Munson.